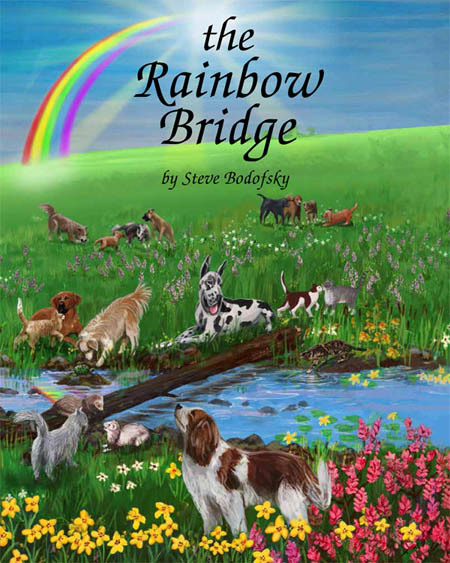 The Rainbow Bridge Picture Book has Hit the Market! It's finally here! The Rainbow Bridge picture book has just been released, and it's amazing! Order a copy for yourself at Amazon. Or, if you've like to buy multiple copies to give out or sell, contact us directly. Want to get a look inside? Click here for a view of what you can expect. This web site is dedicated to pet owners - or more accurately, people owned by pets. By pets, we're talking about dogs, cats, birds, rabbits, hamsters, rodents, horses, and especially ferrets. Those of you snake, lizard, and reptile people, feel free to look around, but don't eat anyone! For ferret folk, we offer news and advice. And we have an exclusive print just for ferret lovers: The Conference, by William ‘Sauts’ Bock. And for everyone who ever had a furry or feathered friend, we proudly present The Rainbow Bridge: an original poem to bring a bit of joy to your heart and a tear to your eye. Check out our picture book, fine art print, and sympathy cards. All profits from anything we sell goes to help support the Last Chance Ferret Rescue. Be sure to stop in and see our page. • For information about any of the products you see here, to order these products by phone, or to discuss any problems you may have with any of our products, call us at 215-357-6071, or toll-free at: 800-259-1745. • To ask a ferret question, or discuss anything about one of your ferrets, call Diane at 215-357-3699. Welcome to the New Rainbow Bridge! Book has Hit the Market! • For information about any of the products you see here, to order these products by phone, or to discuss any problems you may have with any of our products, call us at 215-357-6071, or toll-free at 800-259-1745. © 2018 The New Rainbow Bridge. All Rights Reserved. Web site designed by Steve Bodofsky Productions.